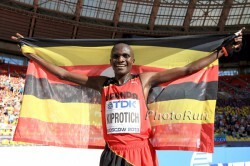 Stephen Kiprotich has proven, without a doubt, that he is one of the Marathon greats, winning two global championships in the space of a year. In 2012, the 24-year-old Ugandan earned the applause of the world with his gold medal victory in the London Olympics. And in Moscow, he added a World Championship Gold over the classic 26.2-mile distance, with his time of two hours, nine minutes, and 51 seconds making him the only runner to go under 2:10 in warm conditions. “I am happy that I wrote history for my country once again—today, I proved that I am a champion and that I can beat the world,” he said in an article posted on the International Association of Athletics Federations’ Website (iaaf.org). “The conditions were very tough and unfavorable but I was determined because I knew that it was the only chance for Uganda to get a medal. I was sure that I was going for a win.” In fact, it was only his country’s second gold medal since the World Championships began in 1983: back in 2005, Dorcus Inzikuru won the first Worlds women’s 3,000-meter steeplechase. Stephen is the second youngest of seven children raised in poverty in the Ugandan village of Cheptiyal. He found his motivation to take up running literally at his family’s front door—where the youngster used to watch local hero Francis Musani, a member of the national marathon squad, run past during his training. It piqued Stephen’s interest in the sport while he was just in primary school. But before he could develop as a runner a mystery illness—never conclusively diagnosed—forced him to quit. He was so sick that he could not go to school for three years, and when he finally recovered he realized he had to concentrate on catching up with his academic studies. It was not until the beginning of 2006 when he was 17 that Stephen took up running again—and he quickly found success. That year he qualified for Uganda’s National Cross-Country Championships, which served as the trials for the junior team at the World Cross-Country Championships. Still only 17, he ran in Fukuoka, Japan, and finished 24th. He was so encouraged by his early success that at the end of the year he left school—deciding instead to focus on athletics over academics. He soon joined Jos Hermens’s management group and began training in Kenya. Today he remains a member of the group—trained by Patrick Sang in Kaptagat—that includes a number of world-class Kenyan marathon runners. Among Stephen’s training partners are Emmanuel Mutai, the 2011 London Marathon champion, and Eliud Kipchoge, the former world 5,000m champion, who made his marathon debut with 2:05:30 in Hamburg in the spring. Interestingly, the group also includes Nicholas Kipkemboi and Bernard Kipyego—two of the runners Stephen defeated in Moscow. With the help of manager Jos Hermens, Stephen made his European debut in 2007, achieving international standards at long distances on the track, roads, and cross-country courses without producing outstanding performances. 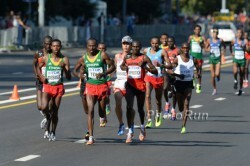 However, all that changed in 2011 when he ran his first marathon at Enschede in the Netherlands. In that race, Stephen was supposed to be only the “rabbit”—making the pace for the established stars. Instead he garnered all the headlines as he ended up running the full marathon, winning it in 2:07:20—nearly two and a half minutes ahead of the second-place finisher—and setting a national record. That impressive showing won him a nomination for the World Championships in Daegu, South Korea where he finished a respectable ninth in extreme heat and humidity. Six months later, Stephen placed third in Tokyo, Japan (2:07:50), one position ahead of Ethiopian legend Haile Gebrselassie, qualifying him for the Olympic Marathon. “This result gave me a lot of encouragement—I’m now confident I can beat the best in the world,” Stephen said before the Olympic Games. In London he went on to do just that—exactly 40 years after the 400m hurdler, John Akii-Bua, won what was until then Uganda’s only Olympic gold in Munich in 1972. The Olympic win vaulted Stephen into superstar status in his homeland—and the World Championship victory has cemented his position as Uganda’s best-known sportsman. At the London Marathon in April this year, Stephen ran in another world-class field, but the fast early pace did not seem to suit him compared to the slower, tactical championship races where he has enjoyed success. 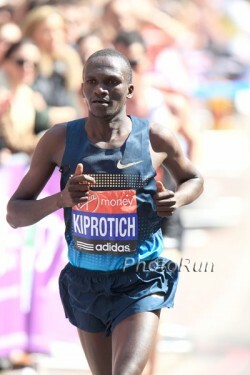 He ended up finishing sixth in London, clocking 2:08:05. “It was the hardest race of my career,” said Stephen, whose best time remains the 2:07:20 he set during his debut. Because of that showing, Stephen was not considered to be a big favorite in Moscow—so his World Championship Gold set off a storm of celebrations at home. The New Vision daily newspaper reported that street parties lasting several days were held in Kapchorwa. When Stephen arrived at Entebbe airport three days later he was greeted by an official state reception and as the procession of cars proceeded from the airport, people lined the streets to cheer on their beloved world champion. Once home, according to New Vision, the world champion took advantage of his celebrity status to publicly raise his concerns about the future of athletics in his country. He first brought up the subject last year after winning Olympic Gold, saying, “In Uganda we need better facilities. I have asked our athletics federation for better facilities and they have been promising them without delivering. That pushed me to Kenya. I spend most of my time training there.” Refusing to give up his mission, Stephen flagged the issue once again on his return from Moscow, taking the opportunity to ask Prime Minister Amama Mbabazi for a progress report on a planned Ugandan high-altitude training camp. The Premier assured him that the center will not only be built—but that it would be named after Stephen.